THE PUBLISHER: Koehler Books – this publishing house produced my first novel Refuge; and now, after my successful Kickstarter campaign, I’m indie publishing Fallen with them. I love their work! SUMMARY: Love takes action: The Creator God establishes the cosmos and shapes a man. Adam rises from the dust. Envious, the powerful angel Lucifer despises him. Oblivious to the threat, Adam is captivated by his strong, intuitive wife Eve. In the Garden of Eden, they enjoy abundant food, gorgeous vistas, and intriguing challenges, including their budding love and passion. They have it all! But Lucifer’ s deceptive brilliance tricks them into disobeying God. They eat the one forbidden fruit. Their innocence is shattered. Their unity with one another and with God is destroyed. Death will follow. Lucifer’s jealousy threatens mankind’s tenuous beginning. But God is merciful. What astonishing promise does He make? How will Adam and Eve survive – broken, shattered, and separated from God? Is there any hope? THE BACK STORY: I spent twenty years researching the biblical and the mythological stories surrounding the Garden of Eden. My own curiosity inspired my research. First, I examined the ancient Hebrew record. I was then delighted to find many similarities to the biblical version in myth, each with their own twist, depending on the culture. This common story spanned cultures. But I was disturbed to see misogynistic ideas arise within myth across all cultures. Spending so much time mulling over the implications of our human roots, the novel took shape in my mind, and I began to write in 2008. I submitted my earliest draft to a female theologian and other scholarly friends who had studied. Each person’s comments helped me to see how I had absorbed some of the story ideas from what I had been told as a young woman, rather than from what I had just researched. So I weeded through my draft repeatedly (revising approximately sixty times), examining each faulty idea I had brought to the story. Unfortunately, much I had been told when I was young was also misogynistic, so this was also an awakening for me of a stronger sense of womanhood found within the ancient biblical record than I had ever been told or had known before. Writing the story became transformational, and this story became more personal than any of the others I’ve written. WHY THIS TITLE? : There’s much “falling” in this story! Lucifer’s fall, falling in love, the fall of humankind, falling into newly learned broken behavior, falling away from one another. 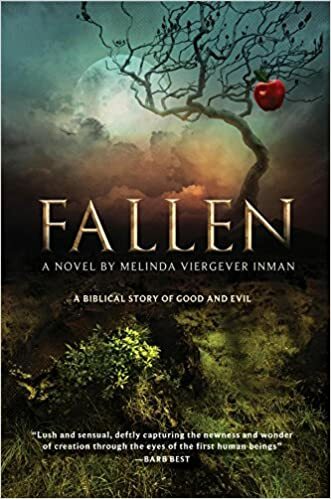 Gradually the overarching theme of Fallen became clear, and this became the title. WHY YOU WOULD WANT TO READ IT: I write fiction that is raw and real. I put the reader inside the heads of the main characters to feel the intensity of their emotions. I’ve rarely seen the emotions of the first couple examined by a woman writer. This story is a balanced, non-misogynistic account of the biblical story with nods to content from myth. I believe myth has its root in real life. My story is a unique tale. For those reasons I’d want to read Fallen. AUTHOR PROFILE: My roots were sunk in a storytelling Oklahoma family. During years of relocation, tragedy struck. Wounded and heartbroken, I forsook my roots and ran from myself and from God. A journey of trial and heartache brought me home again. A prodigal now returned to my secure foundation, I write with passion to illustrate God’s love for wounded people as he makes beauty from ashes. I serve and teach women in prison through a 12-step program. With my husband and family I’m involved with Mission India, rescuing orphans and providing theological and job training for impoverished students. More of my story can be found on YouTube: https://www.youtube.com/watch?v=KnAMzuJGPlE. CONTACT THE AUTHOR: Website: http://melinainman.com.